Water: Prefers medium, but is adaptable to both dry and moist conditions, but will not tolerate standing water. Comments: Hardier than some of the other Hawthorns, this tree was introduced by the Morden Station of Manitoba, Canada. 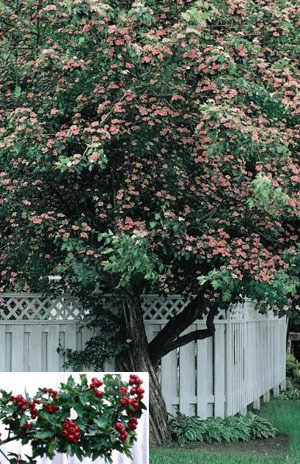 It bears fragrant, large, double white flowers that turn to pink in late spring. Sparse 1/2 inch red fruit. The interesting twisted trunk is an added ornamental feature. Resistant to deer. Relatively low maintenance, buest pruned in late winter once extreme cold has passed. Street Tree? yes Street Tree Conditions: OK under power lines.